Loading and Unloading Petroleum products often requires control of liquid flow when being handled, stored or distributed. Fuel skids are relative small units introduced into the process to control liquid flow. We can design metering units which for many tasks including custody control metering to blending multiple streams to create final products for distribution, or for simple storage management. Automation can include management from a control room creating a Terminal Automation System. Strict Quality Assurance standards can be met especially when implemented with our OSHA Fall Protection loading racks, loading arms, and pipe racks. With critical process functions it is important that these systems be fabricated with precision using only the most reliable components. 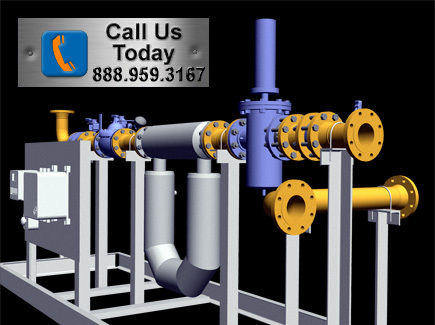 With fabrication and assembly of parts in a controlled environment, we can assure connections and assembly in the field will be smooth, thereby saving you time and money. 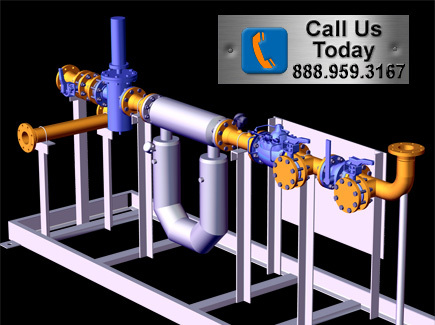 A Metering Skid is the solution for full custody transfer of your fuel to your customer. This system is designed to deliver the fuel at your determined flow rate and is compliant with all standard Local and Federal Codes for fuel handling. Your Metering Skid can accomplish the fuel loading in a safe efficient manner to the truck via top or bottom access fill point and can be designed and made to operate manually or fully automated. Our systems can also be fitted with Emco Wheaton loading arms that have the capability of loading top or bottom, thus providing a turnkey solution. We are also able to integrate loading arm supports into the platform supports which eliminated the need for separate supports and foundations for the loading arms. Overall, because of our innovative design features and modular construction, our projects come in well under budget and on time. Your Fuel Blending Skid is custom designed to provide custody transfer of blended fuel in ratios that range from 1% - 99% while fully compliant with all standard Local and Federal Codes for fuel handling. The Blending Skid is a self-contained mounted safe efficient solution for fuel blending of multiple products as well. The blended fuel is derived through a predetermined recipe entered into a digitally controlled PLC or Programmable Logic Controller. An example of a fuel delivered by the Blending Skid: A.) Plus (89 octane) gasoline with 10% ethanol. This is accomplished by blending 87 with 93 while ratio blending ethanol at 10%. The Blending Skid can also be designed to inject additives at the same time of the fuel blending. Your system will meet the requirements for your blended fuel truck loading via bottom or top access fill point.